People were always asking me how they could use a Fobbie with a gift bag. As with all Fobbie wrapping it's easy! 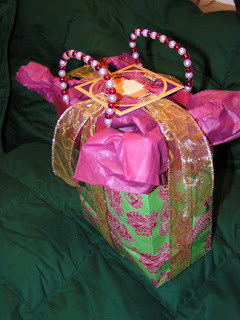 Just pack your bag with your gift, add your tissue paper then then "seal" it with a Fobbie on top. Thread your ribbons like you would around a box, but thread them through the handles. Here is an example. Halloween is over and it's time to start thinking about the upcoming holiday season. 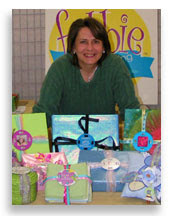 Many of us are invited to attend gift exchanges, or parties and want to bring a small gift. Here is one solution. Pick up some nice festive kitchen towels. 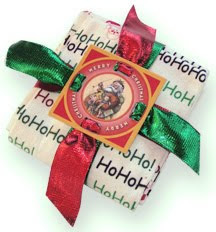 They look good just as they are and wrapped with a Fobbie gives them some extra flare.